Two huge events have happened in my life within the last week. First, I snuck away to have a baby. Our beautiful baby girl, Surya, arrived last Thursday and we have been completely preoccupied with loving on her ever since. Second, I’ve turned over my kitchen to my mother for the next three weeks. Fortunately, I put my -pre-delivery “nesting” instincts to good use and wrote up a few posts before Surya arrived, so hopefully you won’t even notice that I’m gone. Have you ever tried to describe the taste of a bean? I’ve been asking around, and my 8 year old niece came up with the best answers so far. Her first was “beany” and her second was “nothing.” After giving this question some thought [yes, I’ve actually been sitting around thinking about this question, asking people their thoughts and searching on the internet for an appropriate description], I think her second response is close to accurate. Is it true that beans and lentils have no taste on their own and are just conduits for the spices and flavors they are cooked with? Or do they have a flavor by themselves and, if so, what flavor is that? When I think of beans and lentils, I think of tastes like buttery, salty and savory, nutty and creamy. But a bowl of unseasoned lentils is like a mouthful of chalk. This all brings me to Lemon Spinach Pappu (pappu = daal = lentils). Relying on just a few simple ingredients, this is decadence for a savory palate. The scent is lemony and earthy. Licking a spoonful of lemony spinach mixed with mustard seeds, spicy red peppers and creamy daal gives me that same guilty cat-that-swallowed-the-canary look as licking a forkful of mascarpone tiramisu. Except that I’m licking up lentils. Full of protein. With spinach. As in the stuff that gave Popeye big muscles. Enjoying something so healthy with such guilty pleasure must surely make me what – a food dork? A vegetarian geek? I don’t know, but my dad made lemon spinach pappu all the time growing up, and really, it’s a remarkable feat in parenting to get your kids that excited about spinach and lentils. 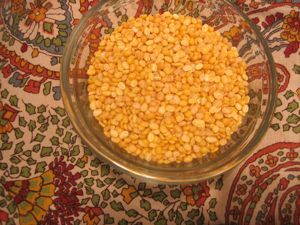 He uses toor daal, but I substituted moong daal because its an easier lentil to cook. It’s small, skinned and split, so you can cook it on the stove top pretty quickly. Toor daal requires either pre-soaking for stove top cooking or a pressure cooker. In search of quicker, less taxing comfort, I opted for moong daal and changed around his instructions a bit to make things simpler. Happy to report that there was nothing lost in flavor by the substitute. Dad also prefers frozen spinach over fresh. There’s clearly an argument to be made for frozen versus fresh and, as he often says, the proof is in the pudding (his pudding), but the one time I used frozen spinach my palak channa (spinach and chickpeas) tasted like cardboard. Bad cardboard. Which I chose to blame on the frozen spinach. 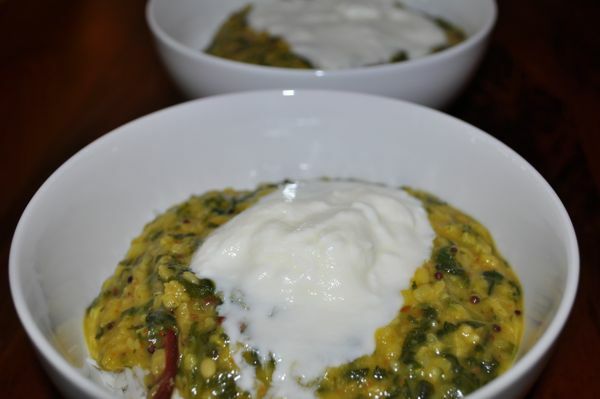 Sweatpants, my sofa and a bowl of hot spinach pappu is all I need on a cold, winter day, a dreary day, a lazy Sunday…really almost any day where I’m craving comfort and warmth. You can add shredded coconut to these lentils if you want to make it a bit richer, but even without it and despite the seeming simplicity of the ingredients, this is a really rich dish. 1. Rinse the moong daal and repeat until the water is clear when you rinse. Add to a sauce pan with about 3 cups of water and bring to a boil. Reduce to a simmer and cook covered for about 10-15 minutes until the daal is tender. Add more water if needed. 2. Prepare the spinach by trimming the stems off and washing. Chop coarsely. 3. In a skillet, heat about a teaspoon of cooking oil on medium-low heat. Add the mustard seeds and cook until they sputter. Careful, they pop. 4. Add the red chili peppers and cook for 2-3 minutes. 5. Add the spinach and cook for about 5 minutes until the spinach is wilted. 6. Add the spinach to the saucepan with the moong daal. Mix in lemon juice and sambar powder. Add salt to taste. Boil for another 5 minutes or so until the pappu is as thick as you would like. If needed, dilute with a little water. I like the pappu to be on the thicker side but still pour-able. 7. Serve hot over rice or with bread and a side of yogurt. First, of all, congratulations! I apologize if this is too nosy, but did you stay veg throughout your pregnancy? Secondly, this looks *delicious*. Yum. Congrats!! Hope you and the baby are doing well! Congrats Nithya! You are supermom already to be able to post a week after Surya’s arrival! 🙂 Can’t wait to see you guys again…. Ooh congrats on the baby- how wonderful!! I look forward to your return, but in the meantime I will have to find sambar to make this! As far as describing a bean..hmm..what type of bean? I have been in a bean mood lately so been experimenting with all different types. Love the flavors and a great use for my containers full of lentils! Congratulations Nithya…you are too cool. Snicking away to have babies…woot…I love it! Congrats on little baby Suya. Is she your first? Life is about to change forever…lol! I love this dal…and your beany banter! This is my first time at your blog. It’s wonderful. I love your stories:) Congrats on your new bundle of joy! @Beatrice – thanks so much! I did maintain a vegetarian diet, although not vegan, throughout my entire pregnancy. We tend to eat a pretty well balanced diet with lots of protien from beans, lentils, soy, yogurt and lots of fresh vegetables. I did make more of a consorted effort to make sure I was getting enough protein, and I took an iron supplement (though I wasn’t deficient). Rajat was thrilled b/c I started eating eggs again too. @fresh365 and Nikki – Sambar is sort of an all spice of South Indian cooking. It’s kind of like garam masala is for North Indian cooking. You can use it to make a lot more than just sambar. We use it to flavor many South Indian style kuras (stir fries) and kootus (stews). Everyone has their own recipe for making sambar powder, but it generally consists of ground coriander seeds, cumin seeds, fenugreek seeds, dried chilis, toor daal, channa daal, mustard seeds and dried curry leaves. If you find yourself near an Indian grocery store, my family has a preference for 777 or MTR brand sambar powder. @Jeff – I can’t even imagine trying to break down the taste definition by the TYPE of bean! Kudos to you if you can find a way to describe say a kidney bean versus a black bean. Btw love your other blog. @Deeba – Thanks so much! Yes, Surya is our first…still getting used to the sleep deprivation. Hi, this is my first visit to your blog (through the aloo and garlic)..
@Julie – Thanks!!! Yep, she was born December 3rd…the first four weeks were a sleepy blur, but she’s letting me get a little more sleep now. She’s been a real treat.